DAVID J. SCULLY has practiced law in Connecticut since his admission to the bar in 1985. 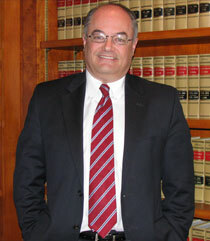 He was a partner in the law firm of Kernan & Henry, LLP since 1996. In January 2010, James E. Kernan, David J. Scully, and John K. McDonald formed Kernan, Scully & McDonald, LLP, Trial Attorneys. Mr. Scully’s primary focus is on cases involving personal injury. He has litigated such cases in every Judicial District in Connecticut as well as the Federal and State Appellate Courts. He also has extensive experience and an active practice in Workers’ Compensation covering all districts in the State. — He has provided pro bono services to clients through the Connecticut Legal Aid Society for over 10 years. Born January 27, 1959 in New Haven, CT. Raised in Orange, Connecticut. Attended schools in Orange and Woodbridge. Married with four children.